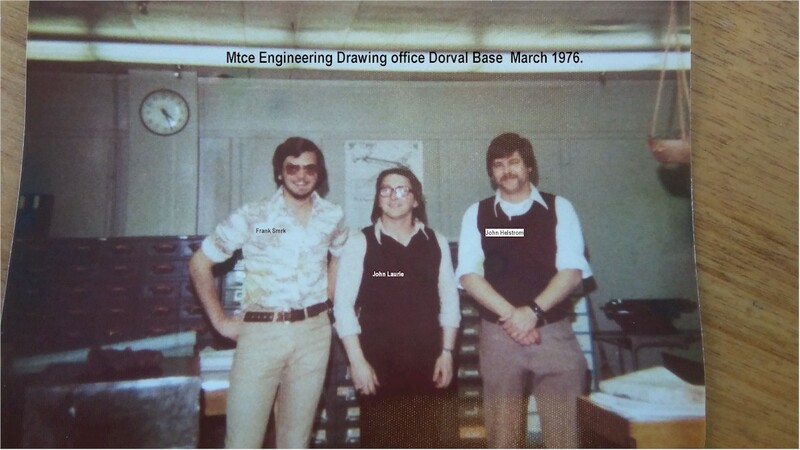 John Laurie has sent us this photograph taken in the Maintenance Engineering Drawing office, Dorval Base March 1976 . Left to right: Frank Smrk with the sun glasses, John Laurie centre and our Supervisor, John Helstrom. Frank left AC shortly after 1976, moved to the Sydney area in Australia and opened a small motor repair shop. I, (myself) John Laurie, joined AC IFS Crew Scheduling where I retired in 2009 after 35 years and I am residing on Lake Louisa, north of Montreal. John Helstrom retirement date is unknown; he moved to Ontario Green Valley area took up gardening but has since passed away. Smrk is correct. Frank told me his grandfather changed the name during the war to be able to escape the Nazis they were from Austria. That was always a frequent question for Frank. His sister Herda Coppola worked in the Power Plant). Here we have the issue for the spring of 2018 cover page. Below is a photo of the crew. Daphne O'Reilly, Yasmine Jghab, Marie-Christine Aucoin, Dino Mezzacappa, Jennifer Murphy, Susana Cantero, Pritesh Gandhi, Amanda Preston, Nicholas Cirino, Michel Kobbi-Moran, Philomena Ferreira, Maria Kolokotronis, Mario Carriere and Cathy Cantwell. Found in the “Horizons” magazine. From issue dated August 1984. Calgary commissary gets new home. Calgary's new $1.3 million commissary building is more than three times the size of the former facility. It occupies 15,000 square feet compared to 4,600 square feet at the original premises. According to Paul Ricciardi, Commissary Services Manager, an annual budget in excess of $7.5 million is required to look after the preparation and boarding of meals and cabin supplies. "It would be easy to look upon airline commissary services as a 'backroom operation', but without them there would be a lot of hungry and thirsty passengers at 31,000 feet," says Paul. Highlighting the building's recent official opening was a ribbon-cutting ceremony attended by Calgary Mayor Ralph Klein; Bill Rowe, Vice President Western Region and Jack Maloney, General Manager Southern Alberta, followed by an 'open house'' for employees and their families. 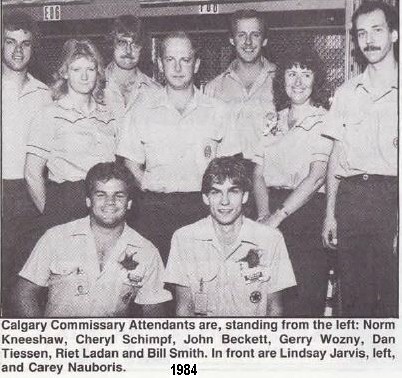 In the photo at left we have, from the left: Calgary Commissary Attendants Norm Kneeshaw, Cheryl Schimpf, John Beckett, Gerry Wozny, Dan Tiessen, Riet Ladan and Bill Smith. In front are Lindsay Jarvis, left, and Carey Nauboris. 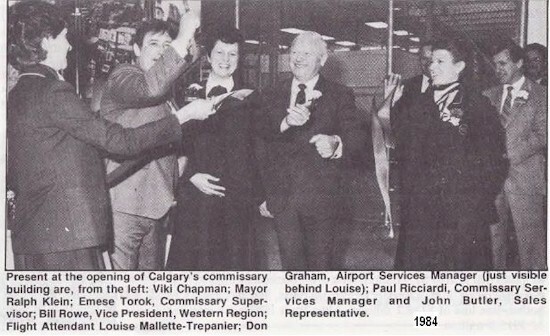 Present at the opening of Calgary's commissary building in this photo below are, from the left: Viki Chapman; Mayor Ralph Klein; Emese Torok, Commissary Supervisor; Bill Rowe, Vice President, Western Region; Flight Attendant Louise Mallette-Trepanier; Don Graham, Airport Services Manager (just visible behind Louise); Paul Ricciardi, Commissary Services Manager and John Butler, Sales Representative. London Gears Up For Expansion. 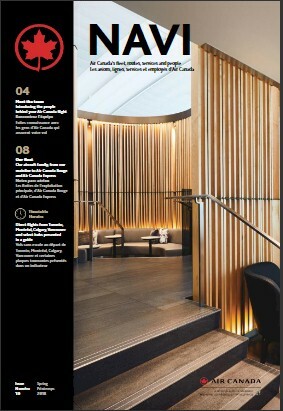 Air Canada's long awaited expansion into the Far East becomes a reality. 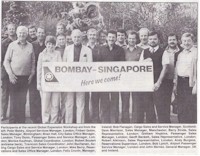 January 15, 1985, will mark the inauguration of service from Toronto to Bombay and Singapore, via London, a route extending halfway around the world. A Lockheed L1011-500 aircraft will operate over the 10,461-mile route. A two day Global Expansion Workshop was held. Participants at the 'Global Expansion Workshop' are, from the left: Peter Baldry, Airport Services Manager, London; Finbarr Quinn, Sales Manager Birmingham; Brian Hall, City Sales Office Manager, London; Tony Dunn, Passenger Sales and Service Manager, London; Monica Kaufman, Global Coordinator, London; Robert Boulert (extreme back), Travicom Sales Coordinator, London; John Buchanan, Acting Cargo Sales and Service Manager, London; Mike Berry, Reservations and Sales Office Manager, London; Felix Cronin, Manager Ireland; Bob Flanagan, Cargo Sales and Service Manager, Scotland; Dave Morrison, Sales Manager, Manchester; Barry Stride, Sales Representative, London; Graham Hopkins, Passenger Sales Manager, London; Geoff Beckett, Sales Representative, London; Robert Atkinson, Sales Representative, London; Andy Burgess, Reservations Supervisor, London; Bob Lynch, Airport Passenger Service Manager London and John Barnes, General Manager, U. K. and Ireland. On January 15, 1985, the Lockheed L1011-500 aircraft fin # 553 C-GAGH carves out its own niche in the airline's history books by leaving Toronto on the first leg of Air Canada's longest route ever. This inaugural flight to Singapore - via London and Bombay - stretches 10,461 miles and takes passengers over Belgium, Germany, northern Austria, Yugoslavia, Bulgaria, Turkey, Syria, Saudi Arabia, the United Arab Emirates, Oman, over the Arabian Sea and to the subcontinent of India. First, Mother Nature wreaked havoc on the operation when a snowstorm blanketed London Heathrow Airport (LHR) in mid–December. Then, a British Airport Authority water main broke at LHR on December 22, resulting in extensive water damage to our cargo terminal. 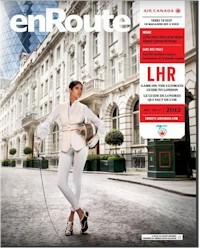 Consequently, our Cargo colleagues at LHR were without electricity for a period of two weeks. 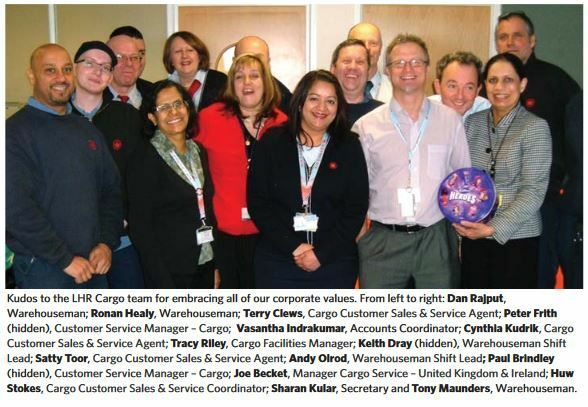 Kudos to the LHR Cargo team for embracing all of our corporate values. From left to right: Dan Rajput Warehouseman; Ronan Healy, Warehouseman; Terry Clew, Cargo Customer Sales & Service Agent; Peter Frith (hidden), Customer Service Manager – Cargo; Vasantha Indrakumar, Accounts Coordinator; Cynthia Kudrik, Cargo Customer Sales & Service Agent; Tracy Riley, Cargo Facilities Manager; Keith Dray (hidden), Warehouseman Shift Lead; Satty Toor, Cargo Customer Sales & Service Agent; Andy Olrod, Warehouseman Shift Lead; Paul Brindley (hidden), Customer Service Manager – Cargo; Joe Becket, Manager Cargo Service – United Kingdom & Ireland; Huw Stokes, Cargo Customer Sales & Service Coordinator; Sharan Kular, Secretary and Tony Maunders, Warehouseman. 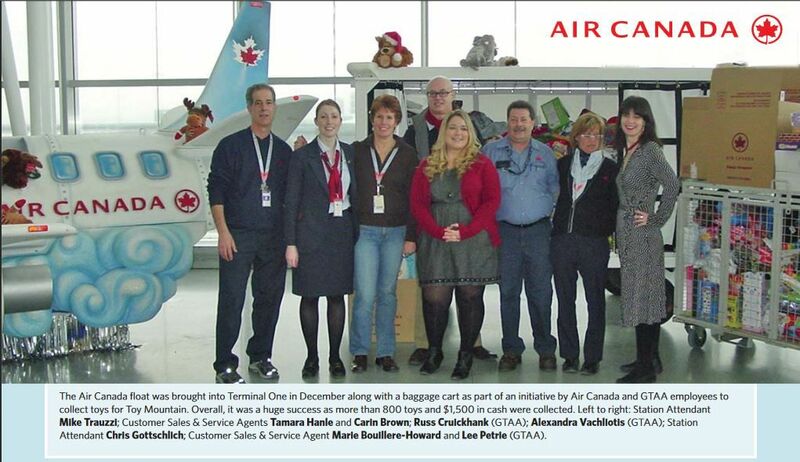 The Air Canada float was brought into Terminal One in December along with a baggage cart as part of an initiative by Air Canada and GTAA employees to collect toys for Toy Mountain. Overall it was a huge success as more than 500 toys and $1,500 in cash were collected. 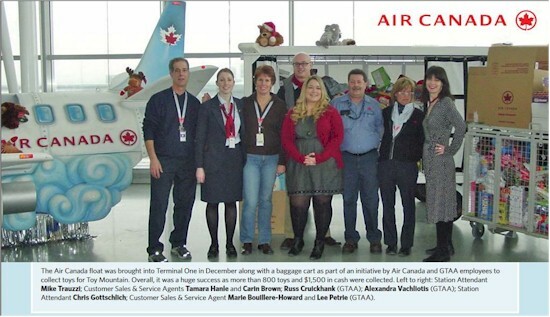 Our photo has, from the left: Station Attendant Mike Trauzzi; Customer Sales and Service Agents Tamara Hanle and Carin Brown; Russ Cruickhank (GTAA); Alexandra Vachliotis (GTAA); Station Attendant Chris Gottschlich; Customer Sales and Service Agent Marie Bouillere-Howard and Lee Petrie (GTAA). Extracted from the "Parts & Pieces" magazine Issue dated October 1997. 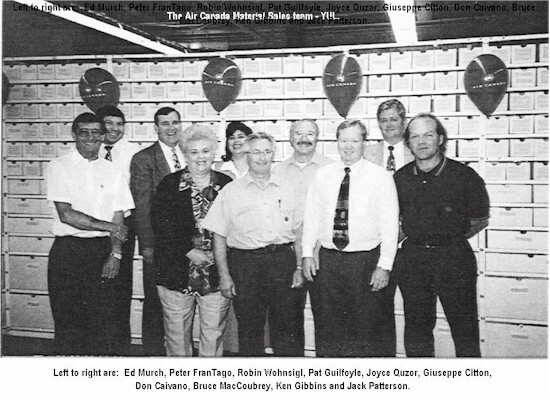 The Air Canada Material Sales Team celebrated the grand opening of their new surplus sales area on September 3,1997. To celebrate the occasion, the team invited Robin Wohnsigl, Vice President of Technical Operations, and Bruce MacCoubrey, Director of Purchasing and Component Maintenance, the J.I.D.T. Main Stores Stockkeepers and other personnel of business units from Tech Ops branch. The material sales team wishes to thank all individuals involved in making this vision a success. 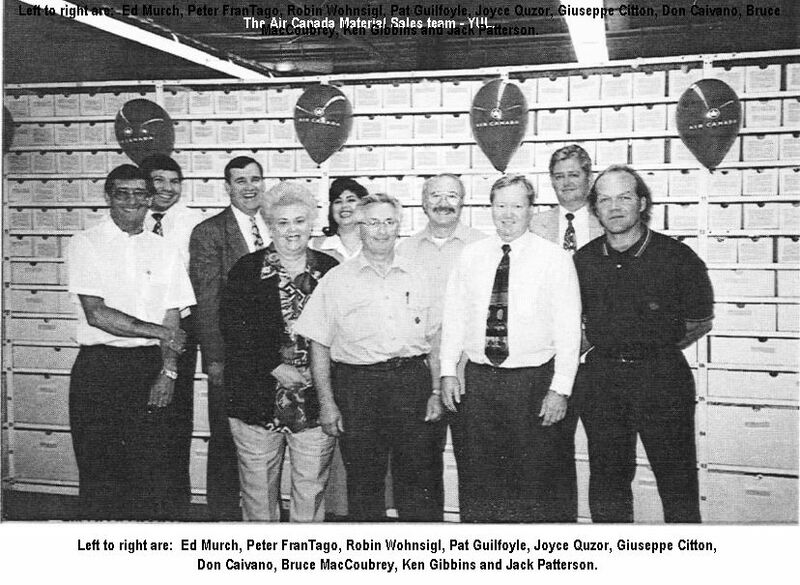 ln the photo from left to right are: Inspector, Ed Murch; Sales, Peter FranTago; Vice President Tech Ops, Robin Wohnsigl; Sales, Pat Guilfoyle; Sales, Joyce Quzor; Stockkeeper, Giuseppe Citton, Don Caivano, Director of Purchasing and Component Maintenance, Bruce MacCoubrey; Manager Material Sales, Ken Gibbons and Stockkeeper, Jack Patterson . Missing from the Photo are Stockkeepers Peter Koshman, Richard Alexandrowich and Manager of Purchasing and Inventory Services James Duncan. Below is a video of a GIANT (1:6 scale) Radio Controlled (RC) Lockheed SUPER CONSTELLATION TWA 'Star of America' AIRLINER. It is owned and built by Keith Mitchell, this model took 5 years of combined design and construction. 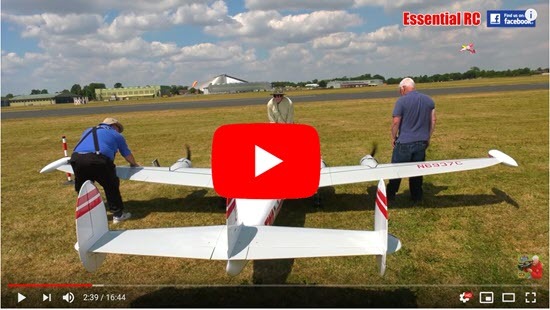 Its initial flights were taken under the Large Model Association scheme (approved by the CAA) for model aircraft over 80KG. It underwent 12 test flights for combined flight time of more than 2 hours to get it's LMA\CAA certificate to fly at public shows. When the war began, C.P.R. made plans to service and operate the bombers being flown to England and today it has a large servicing and operations organization of over 300 persons in Montreal. One cannot be in Montreal long without seeing buses marked "C.P.R. Air Service." Neither can one be in Montreal long without seeing pilots wearing the insignia for "Trans-Atlantic Airways." Although the planes being flown to England are bombers, the ferrying is strictly a commercial operation under control of C.P.R. The R.C.A.F. and R.A.F. have nothing to do with it. How Canadian air transport expansion will affect the airlines in the U.S. is a speculative matter. Because of its geographical position, Canada has a strategic advantage in over-ocean flying. It is also in the best position insofar as air traffic to Alaska is concerned. To date Trans-Canada Air Lines has not been competitive with U.S. airlines to any substantial extent, but Trans-Canada's projected New York-Toronto route should be a busy and profitable one in the future. When Trans-Canada extends to Whitehorse, Yukon Territory, the Canadian line will have the shortest and most direct route to Alaska from New York City. November 5, 2018 - From the desk of Captain Terry Champion (retired) - RE: Capt Jack Johnson's Jenny. The plan for the placement of the Curtis Jenny at the Museum is to move an airplane or two away, in order to open up a wide enough space to create a prominent location. This will be done early in January, the wings attached and the display built. The alternative platform will not be needed so the funding target has been reduced accordingly. Including the acquisition cost and installation of the display, the target is now $8,000. The total donations received so far is $2,925.00 with some firm pledges still to come. I am working on some funding alternatives besides PWA employees, but at any rate the PWA employees will receive recognition at the display. The Jenny funding appeal will be included in the Museum's external and internal communications and we can stretch the campaign out longer than originally planned. Found in the "Info Canadian" magazine. 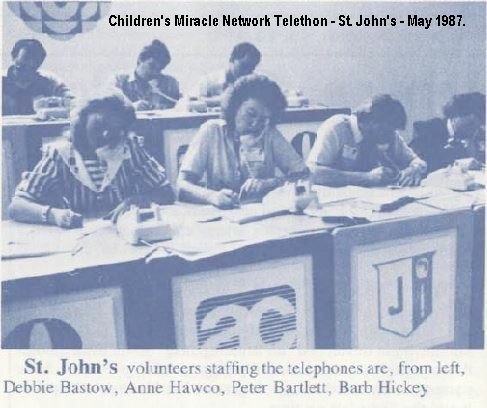 The Children's Miracle Network Telethon was held on May 1987 weekend raising over $39 million for 160 children’s hospitals in Canada, USA, Mexico and Australia. 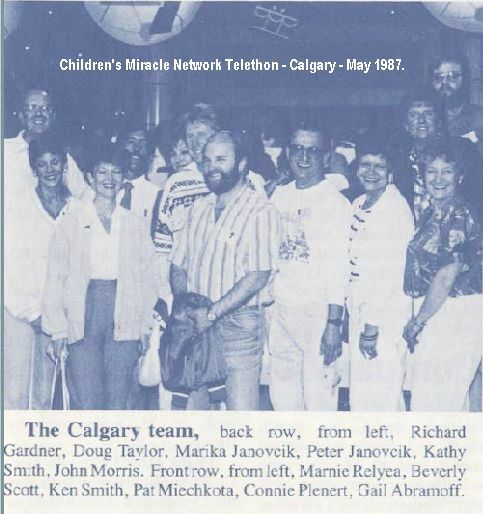 Back row from the left: Richard Gardner, Doug Taylor, Marika Janoveik, Peter Janoveik, Kathy Smith and John Morris. Front row from the left: Marnie Relyea, Beverly Scott, Ken Smith, Pat Miechkota, Connie Plenert and Gail Abramoff. 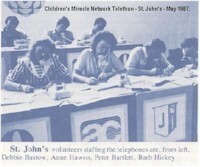 Here we have the St. John's team from the left: Debbie Bastow, Anne Hawco, Peter Bartlett and Barb Hickey. Eight former PWA employees who, during 1987, will have completed 25 years’ service with the airline, were honoured at a dinner held in Calgary. In this truncated photo are: Hank Froese, Supervisor Maintenance, Calgary; Norm Penner, Airport Service Manager, Toronto; David Bjornson, Maintenance Crew Chief, Winnipeg; John Glynes, B737 Captain, Calgary; Ted Ranson, V.P. 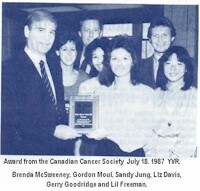 Passenger Charters, Vancouver, Gordon Mackenzie, B-737 Captain, Calgary; Mary Ann Garbencius, In-Flight Services, Edmonton and Bill Wiggins, Maintenance Chief, Vancouver. 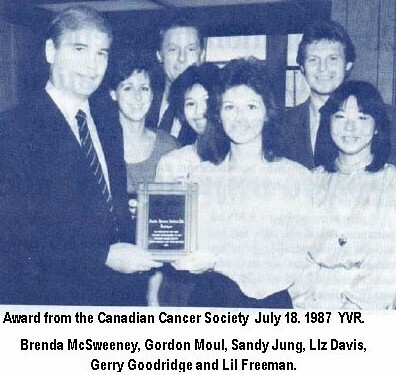 Dave Hodge, former host of 'Hockey Night in Canada' and sports director for a Vancouver radio station, presented plaques July 18, 1987 on behalf of the Canadian Cancer Society to a group of Vancouver employees. In making his presentation, he praised the employee group for contributing their time and energy in the battle against cancer. Accepting the award from Hodge, are: Brenda McSweeney, Revenue Accounting Clerk: Gordon Moul, B-737 Captain; Sandy Jung, Personnel Administration Coordinator; Llz Davis, Benefits Administration Assistant; Gerry Goodridge, Manager, Public Relations B .C. and Lil Freeman, Pesonnel Administration Coordinator. 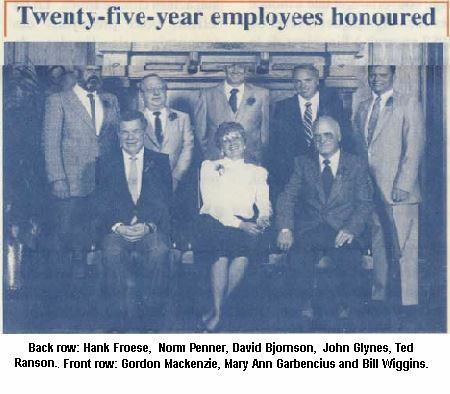 All of the employees of Ontario Express Ltd., The Canadi>n partner airline in Ontario, were on hand for this photo which appeared in a Toronto newspaper. Part of the company's Jetstream 31 fleet is positioned in the background. The company began operations on July 15, 1987. 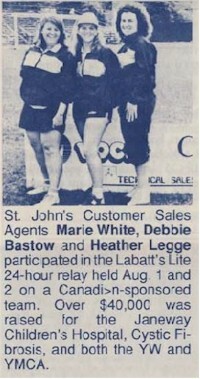 St. John's Customer Sales Agents participated in the Labatt's Lite 24-hour relay held August 1 and 2 on a Canadi>n-sponsored team. Over $40,000 was raised for the Janeway Children's Hospital, Cystic Fibrosis, and both the YW and YMCA. In our photo we have Marie White, Debbie Bastow and Heather Legge. I always enjoy web surfing to find new subject matter for my NetLetter articles. When I happened upon the Wikipedia page for Canadian aviator, Lynn Garrison, it read like a combination of humanitarian biography and an espionage thriller. Mr. Garrison decided that he was going to be a pilot at only four years old. His family hosted student pilots from the British Commonwealth Air Training Plan during the Second World War. These students must have seemed to be very heroic to the young boy. Mr. Garrison began his extraordinary aviation career when he joined the RCAF at the age of 17. 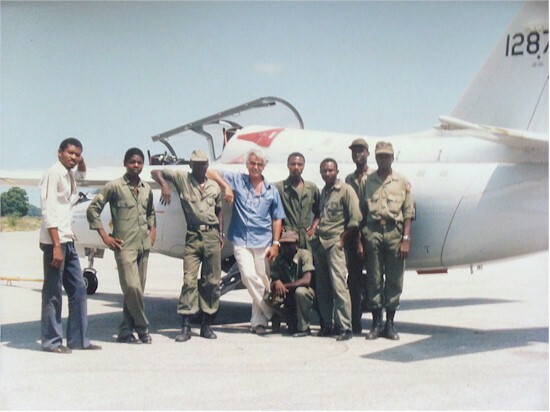 He would go on to a distinguished military career followed by adventures as a commercial pilot, film producer / technical adviser, classic aircraft collector and mercenary. He has often commented that, ”If it has fuel and noise, I can fly it”. His most interesting activity was in the early nineties, and after the age to 50, he became somewhat of a clandestine adviser to the military regime in Haiti with the code name of “The Shadow” and was personally involved (through spying activity) in negotiations with the Clinton Administration to return the elected government to power in Haiti. Garrison had been involved in humanitarian causes in Haiti since 1982 when he created “The Haitian Children's Fund” and continues his involvement today. There is far more to the story of this extraordinary adventurer, mercenary and humanitarian; click the link below for the complete story. By far the most significant development of the year for Trans-Canada Air Lines was the introduction of 20 large North Star aircraft on domestic and overseas routes. In a review of the year, Mr. G. R. McGregor, President of the airline, revealed that the seating capacity of the fleet had been increased by 50 per cent and another 5,000 miles had been added to T.C.A. routes bringing the total from 11,000 up to 16,000 miles. 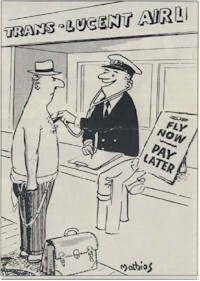 During 1948 some 20,000,000 revenue miles were flown which is an increase of 2,000,000 over the previous year. Air cargo ton-mileage increased by 70 per cent, and mail ton-mileage was increased by 67 per cent as the result of a new policy of carrying first class mail by air at unchanged postal rates. Commonly called "all-up" mail, this service provides for the carriage of all letters in Canada, weighing an ounce or less. North Stars were introduced on trans-Continental services on June 1st, flying two round trips daily between Montreal and Vancouver. Some of the latest type were added to the North Atlantic fleet which permitted two flights daily between Canada and the U.K., as well as many charter flights. In all T.C.A. flew the Atlantic 1,400 times on revenue services during the year. With the introduction of North Stars, the DC-3 fleet was diverted to service on Provincial routes. Services were opened to Bermuda on May 1st with two flights a week from Toronto and Montreal and later a third flight was added. Services to the British West Indies started in December, flying from Montreal to Toronto, Nassau, Kingston and Port-of-Spain, twice a week, one finishing at Jamaica and the other continuing to Trinidad. Although it is thought that traffic will be mostly with holidaymakers, and consequently seasonal, the route touches areas of agricultural and industrial significance to Canada. On domestic services in 1948 T.C.A. carried 537,000 passengers, 2,540 tons of mail and 1,665 tons of cargo. Overseas flights accommodated 31,300 passengers, 999 tons of mail and 290 tons of cargo. In addition, 175 west-bound crossings of the Atlantic were made with immigrants, and in June T.C.A. 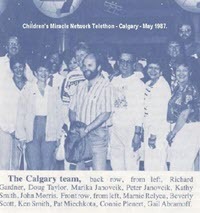 flew six round trip flights a day over the Rockies to move 9,000 persons and 600,000 lb of food to and from British Columbia, when surface connections were severed through severe floods. The T.C.A. fleet now consists of 20 four-engine North Stars, 27 DC-3's, and seven Lodestars. 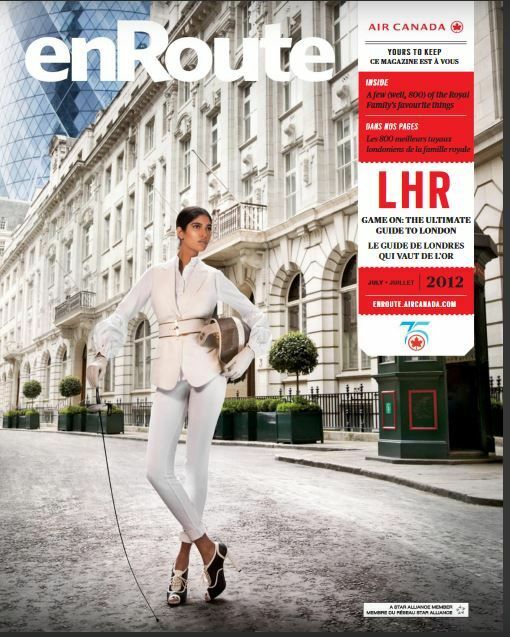 Improvements along the routes were carried out in office and hangar accommodation and to runways at some airports. No large route extensions are foreseen by T.C.A. in the immediate future, but the policy will be to consolidate those routes which are already being flown. Captured during its first visit to Airbus's Bremen facility, the A330-based BelugaXL transport made is stop at the German site as part of a test campaign which will check its loading system and compatibility with the plant's newly modified docking station. Service entry is due in 2019. Tips for headache-free holiday standby travel. It’s the winter holiday season and current booking forecasts indicate high flight loads right across our network. As our airport colleagues are busy assisting our revenue customers, they may be unable to help you purchase ZED electronic tickets or to suggest alternate routes on other airlines. Don't be caught waiting for days—be prepared! Download the ACLife app on your mobile device, if you haven’t done so already. Purchase your backup ZED tickets before your trip. Consider using your GoAC discounted privileges and fly confirmed. Check in on the web, on the AC mobile app or at the kiosks where available. Consider checking in your carry-on bag. Our airport colleagues and our revenue customers will appreciate it and it’ll make it easier for you when you board. If you haven’t had the opportunity to check in your carry-on bag, please volunteer to gate-check it when volunteers are being solicited. Fast fact: If you’ve already checked in for a flight, you can offload yourself on aircanada.com or Air Canada's mobile app by simply going back to the web or the app and check in. You’ll be immediately prompted with an option to cancel your check-in. This will enable our agents to focus on assisting our customers booked on the flight. 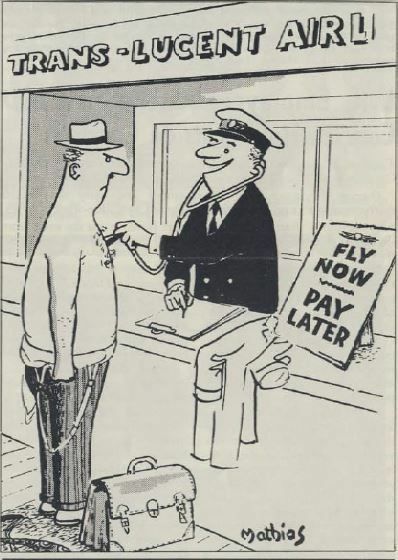 This cartoon by Dave Mathias appeared in the "Between Ourselves" magazine issued November 1958.